Armed with creative mind and experience. Get in touch if you need results and designs of great value. Always available for 1-to-1 projects. "Great designer for a challenging project"
"Good understanding of our project !" "Tolle Design-Vorschläge. Änderungswünsche wurden schnell umgesetzt. Sehr angenehme Zusammenarbeit." "Great design. Great collaboration with the designer." "I think he is a great designer!" "It's like we expected it. Designs were done fine and quick. Top!" "Just awesome, the designer and his creations!" "Love working with heroicdesigns. He understands the briefing immediately and makes every design his own without losing the branding of the company in his design. Very creative, very helpfull, very professional designer! Absolutely, 100% my favorite desi..."
"FANTASTIC! I would hire Heroic again without hesitation. I recommend Heroic to anyone looking for professional grade designs, done quickly, and exactly to your specifications." "Excellent work. Responsive designer. Hope to see their designs in future contests"
"Great design and wonderful to work with! Thank you Bryan." "Great design, crafted in a nutshell. Helped us a to push our CD and our image further. Thanks very much!" "Efficient, skilled, and a great communicator. " "Great person, great personality, great spirit and most of all, great creative mind!" "Fantastic service and very thorough. Understood the brief right down to the last point and created a brand that is easily recognisable. Highly recommended. " "Very simple but good design. Very clean and well placed. Quality work..."
"Super enthusiastic person, very kind, very friendly and most importantly, very creative! He understood the briefing immediately. Picks up the feedback quickly, although the cooperation was brief, I very much enjoyed it! " "Fantastic! Work was done quickly, creatively and such a pleasure to work with." "Thanks for your fast work with our changes! " "Excellent work. Very professional. Highly recommend!" "Awesome work thank you, looks great! " "We chose the design in addition to another design, because we really liked the layout and the prime look it had. Different to what we asked for, but very convincing." "Excellent designer and very happy with the choices he gave me along with the quick response/edits." "Excellent work! It was a pleasure working with you. " "Many thanks for the great cooperation! Very quickly it came to a creative implementation. Differently than I had imagined it and at the same time the idea of the representation convinced me. Thank you very much! " "Great design and very easy to work with!" "Very easy to work with - Great job!" "Really great work! Highly recommend!" "Easy to work with as always! Ensures the final product is to your liking. Thanks!" "Great design - clean message - I would use again. " "Heroicdesign was a pleasure to work with and very responsive. Only a minor adjustments needed and was quick to make any revisions. I’m very happy with the banner heroicdesign has created for my business and would be happy to work with again. " "Brilliant designer, really tuned into what I was looking for and provided a very high quality service - i'm delighted!" "Was able to take a somewhat vague brief and come up with something that worked for us. Clean design, responsive, and easy to work with. Thank you heroicdesign! " 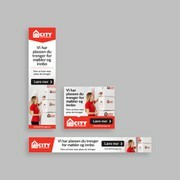 "Great work, understood all the requirements and great designs." "I booked heroicdesign twice and he did the job to my fullest satisfaction. Very nice contact and good and fast work." "Excellent designer, attentive and very responsive." "Provided high quality design and quickly." "Very happy with the end result... not many designers on 99Designs animate as well, therefore I had very few entries which were animated designs, so it was great to have an outcome I loved. Very friendly, fast work and updates. Thank you!" "This was my first time using 99Designs, the process was easy and Heroicdesign was responsive and presented several options for me. I will be back ... Again Thank you!" "heroicdesign was ready from the beginning. Always asked what he can do better and tried to understand exactly what I needed. I am happy with the new design. " "The designer is very friendly and widely talented. Willing to make slogan changes after money was released to him. Will definitely use him again." "Very committed and good turnaround times. Would work with heroicdesign again for banner design." "Great work and professional! Accommodates to your needs!" "I love the animated banners that were provided. Very willing to make numerous minor adjustments throughout the process. I would definitely recommend!"